What Do You Want to Know About Forza Horizon 4? 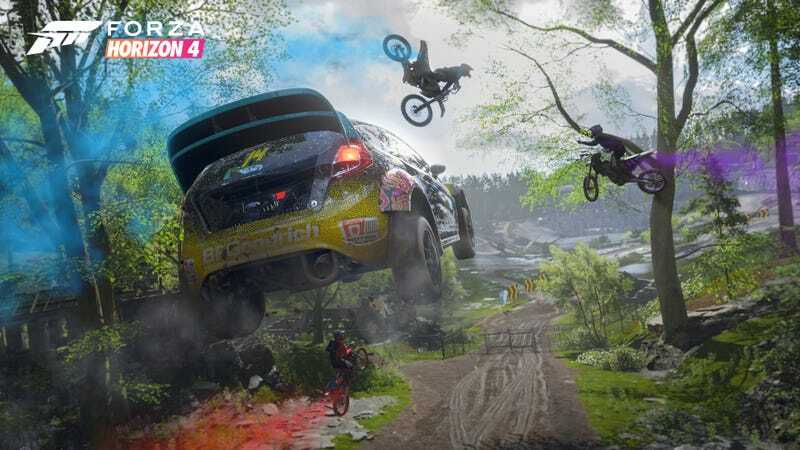 Microsoft’s fourth installment of the Forza Horizon series, Forza Horizon 4 will be released on Oct. 2, but yours truly has been puttering away at the game for the past couple of days in order to review it. I can’t yet tell you anything about it yet, because embargoes and everything, but what would you like to know about it? As a reminder, Horizon 4 is open-world and takes place in the UK. It will have over 450 cars to choose from, which is about 100 more than Horizon 3. There will also be dynamic seasons. So, in the wintertime for example, lakes will freeze over. If your dearest ambition is to slide a McLaren Senna across a frozen body of water, then Horizon 4 is the place to do it. We also did a Twitch stream with our friends at Kotaku last week, which you can check out here. Let me know what I should go and do. Launch something off a cliff? Crash something? Build something completely batshit? There are no rules, it’s a Horizon game. As mentioned above, the game will be available on PC and Xbox One on Oct. 2. Anyone here pre-order it?